At Sutton Circuit we can operate your session as either an open timed practice, Grand-Prix style race event, or for larger groups, we can operate a team endurance race format. Get on track and hone your skills, 15 or 30 minutes open timed practice sessions are open to both adults and juniors and are the fastest way to get out on track at Sutton Circuit. Great for groups of up to 12 people. Grand-Prix racing action with qualifying and heat races for small and large groups, 5 minutes qualifying then form up on the grid for a 20-minute race. Up to 12 karts on track racing at a time. Classic sprint racing from only £29.00 per person. Great for groups of 12 or more, no upper limit on the number of drivers, fantastic for larger groups get everyone involved and racing in teams. 5 Minute qualifying sessions with 30 minutes of track time per driver during the race. 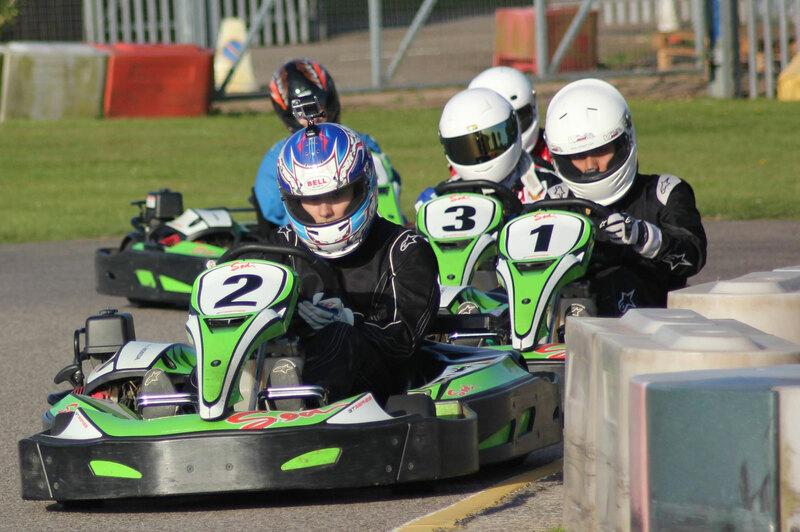 Packages available to accommodate teams and groups from 8 to 48 drivers, inter-department racing events, bring your team together for an evening or afternoon of high energy racing. Bring your own pop-up signage. Catering available on request. Team karting events from £40.00 per driver. Our outdoor circuit is tight and technical giving you very little rest on track, time practice and race heats are usually broken into 15-minute sessions, endurance events can be run to any length dependant on your group size.